Under the theme “Live with us… You’ll understand”, around 400 Caritas Lebanon young volunteers gathered in the Saint Joseph Theater (Cornet Chehwan) on Sunday 26 May 2013, in presence of His Eminence Cardinal Leonardo Sandri, Prefect of Congregation for Oriental Churches, the Apostolic Nuncio to Lebanon, Bishop Gabriele Caccia, Antelias Maronite Bishop Camille Zeidan and Caritas Lebanon President Fr. Simon Fadoul. Members of the Bureau, the Regions and the Sectors, as well as Caritas Director and National Chaplain also attended the ceremony. 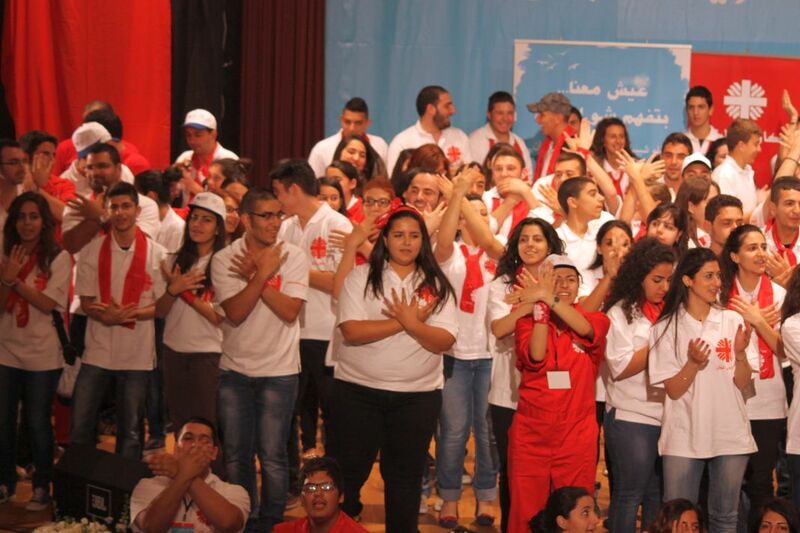 Many activities followed Caritas Youth coordinator and MC Elie Kadamani’s word of welcome. On several occasions, Sector Rmeil young volunteers performed a spiritual dance to the jingle “Live with us… You’ll understand!” to teach it to participants, and a spiritual scene was played by Saida Sector’s volunteers. The Tripoli Hip Hop Revolution Troupe presented scenes and songs describing young people’s life in Tripoli and how they use art to deal with the Jabal Mohsen and Bab el Tebbaneh battles. Also, one documentary on Caritas Lebanon’s programs and another on its activities for the youth as well as two video clips prepared by North Bekaa Sector were screened. A few testimonies were given during the meeting. First, actors Georges Khabbaz and Wissam Hanna insisted on the importance of volunteering in someone’s life. Then, Sabine Bahout (Rmeil Sector) and Antonio Mouawad (Zghorta-Zawieh Sector) talked about their experience as volunteers for Caritas Lebanon. Last, Therese Imad said that being part of Caritas’s volunteers taught her to thank the Lord for everything she owns. During mass, that was animated by Saint John Choir (Bauchrieh), Fr. Faddoul stressed on the importance of the humanitarian role played by Caritas Lebanon and expressed his desire to see the start of a joint venture between both the catholic and orthodox youth. “Today, it is very important for all Christians to unite, not only to live charity but also to build peace and reconciliation”, he added. Last, each young volunteer committed themselves to recruit at least one candidate, in order to better serve people in need nationwide.